More than 150 students, parents and others recently raised $35,000 for childhood cancer research by volunteering to have their heads shaved as part of a “St. Baldrick’s Day” event that has become a tradition at the school. The Cubberley event was part of a national fundraising effort by the nonprofit St. Baldrick’s Foundation (the name combines “St. Patrick’s Day” and “bald”) that coordinates events nationwide where volunteers have their heads shaved in solidarity with children who are fighting cancer. Donors pledge money for each shaved head. Cubberley’s event was No. 1 in California and No. 2 in the nation for the number of kids participating. This year’s event included 38 members of Lakewood High School’s baseball program. Proceeds from the Cubberley event benefit the Miller Children’s Hospital/Jonathan Jaques Children’s Cancer Center (at Long Beach Memorial Medical Center). 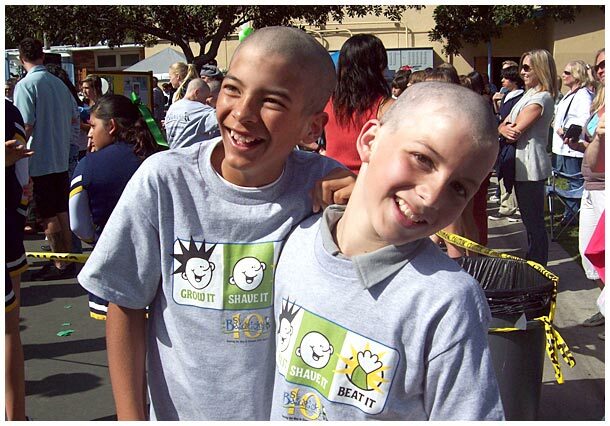 CLOSE SHAVE -- Sixth graders Gaspar Garza, left, and Nic Cornejo were among more than 150 Cubberley K-8 School students, parents and others who raised $35,000 for cancer research by volunteering to have their heads shaved as part of "St. Baldrick's Day."